I’m not a perfectly organized mama. 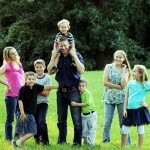 I have 6 kids (aged 15, 14, 12, 10, 8 and 4) and I work 3 part time jobs. I have 2 homeschooled kids, 3 in public school, and 1 in private Christian school (where I also teach High School Music.) My children help out by getting their own breakfasts in the morning and packing their own lunches. I try to make that easier by having the supplies ready to go for them. We divide up bulk packaged foods into single serving baggies, and everyone has their own basket of snacks. The kids help with this or I would never get it all done. That’s not the secret to our low budget though—that’s just the secret to my sanity. The first secret to spending less is that we use cash. I get $500 in cash on the first day of the month and have to make it last to meet our needs all month. When the money is gone, I can’t buy more food. Knowing that, and being able to see at a glance how much money I have left, allows me to make better buying decisions when I’m at the store. We do what we HAVE to do. The second secret is that we rarely eat out. By rarely, I mean Darren and I go on a date once a month or so, and occasionally we’ll treat a child when we’re out with just one, but as a whole family, never. Not that I think eating out is evil. I think it’s awesome! Just expensive. Skipping eating out includes drive through coffee and gas station fountain drinks as well. That gets hard when life gets busy. I compensate for potential dinner time panic (You know the times when ordering pizza delivery feels like the only solution.) by having a meal plan sprinkled with a few fast to fix meals that I can throw together in a jiffy. We’re not above scrambled eggs and pancakes for dinner. I wrote my own family meal plans for years. Then discovered that my blog readers were interested in having a plan done for them too, so I gave the plans a LOT more detail, added an option with breakfasts, lunches, and snacks and Grocery Shrink Plus was born. If you think this would help you too, I’m offering a 50% off sale just for Stacy’s readers. The third secret is planning meals around low cost pantry staples. We eat a HUGE variety of foods, but they are all different combos of common ingredients. I’m familiar enough with these foods and what they cost, that if I see them on sale for a REALLY great price, I recognize it and stock up. I try to buy enough that I won’t need to buy them again until there’s another sale. To recap: each month I’m restocking my pantry with rock bottom sale items, and buying just the fresh things I need (like produce and dairy.) I call this the “Pantry Method” and it allows me to spend less than most couponers do, PLUS I end up with the stuff I actually use. I love not messing with coupons. Trading home grown stuff for more variety For example, I trade homemade Kombucha to a family for home raised eggs and occasionally hamburger. It would work with veggies too. Being careful not to assume that just because it’s sold at a particular store (like a warehouse club), that it’s a good deal. Knowing prices. I hope you found a tip that was helpful today. If you ever find the time to visit at Grocery Shrink, please leave a comment letting me know you’re a friend of Stacy’s too. I’m Angela Coffman, a mom of 6, known for doing a lot with a little money. I write about reaching financial goals by eliminating waste in everyday spending. We’ve done this too, following the same guidelines. We have 9 kids, just 3 teen boys left at home now. Also, look for dent can/salvage grocers in your area, it can be worth an hour’s drive to go to one once a month. Make pasta, rice or potatoes the filling part of your meal, use eggs or beans as proteins instead of meat every night. Grow a garden and can and keep your eyes open for great deals on fruit or veggies to can. 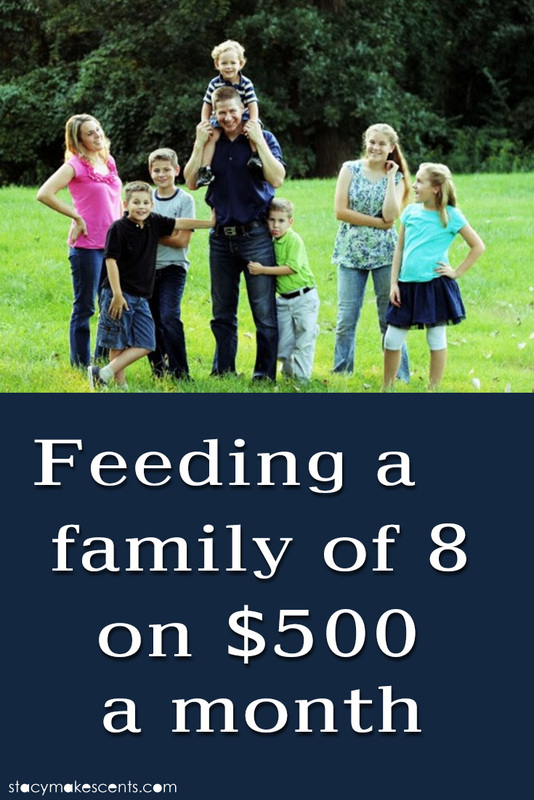 Feeding a family of 8 on only $500 every month is very impressive! I like the idea of pulling out the grocery allowance in cash, and certainly cooking from scratch.